A 16-carat iolite from Palmer Canyon, Wyoming. I discovered iolite (water sapphire) at Palmer Canyon in 1995. The iolite occurred with gem-quality kyanite in mica schist & gneiss adjacent to vermiculite that had enough silica to form these gems. I couldn’t believe the amount, size & beauty of the stones. The single, largest, iolite gemstone on earth was found at this time -the baseball sized Palmer Canyon Blue Star- a 1,720 ct flawless gem. So I went looking in similar terrains & predicted in a book I would find iolite at Grizzly Creek to the south. In 2005, I discovered iolite at Grizzly Creek & recovered the largest iolite gem (24,150 carats) on earth (the football sized Grizzly Creek Blue Giant), but this was dwarfed by giant, VW bug-sized masses in the outcrop I left behind because I didn’t have tools necessary to recover such large gems of 1 to 5 million + carats. Based on geology, I predicted several other iolite deposits would be found in central Laramie Range & Copper Mountain, but most remain unexplored. Over the years I tried to get some investors interested in forming a company to take advantage of these giant deposits – explore for more, mine them, cut the gems, design jewelry and market them, but no one wanted to take on this task, so they all essentially sit there collecting dust and eroding away. explored this region for aluminum & magnesium & during the mid 20th century and they reported one deposit that had been trenched and mapped contained 500,000 tons of cordierite (when gem-quality, cordierite is known as iolite). I began looking at this deposit & found flawless gem-quality ioilte along the edge of the deposit. All of the material reported by theses earlier geologists likely was part of the largest gemstone deposit found in history. But they were so focused on the use of the material for magnesium and aluminum, they overlooked the gem potential. Besides, in the mid-20th century, there was not much of a market for iolite gemstones. iron and will ‘rust’ under the right conditions. But let’s look at this deposit as a potential gem deposit. It is unexplored for gems except along the one margin where everything I examined was of the highest quality gem material. The rest of this deposit needs to be examined. Why? One ton of material contains 4.5 million carats! Multiply that by 500,000 tons and this could potentially have more than 2 trillion carats just on the surface and no one knows how deep it goes. If it is just 100 feet deep (it likely is a few thousand or more feet deep), it would dramatically increase the amount of recoverable gemstones. 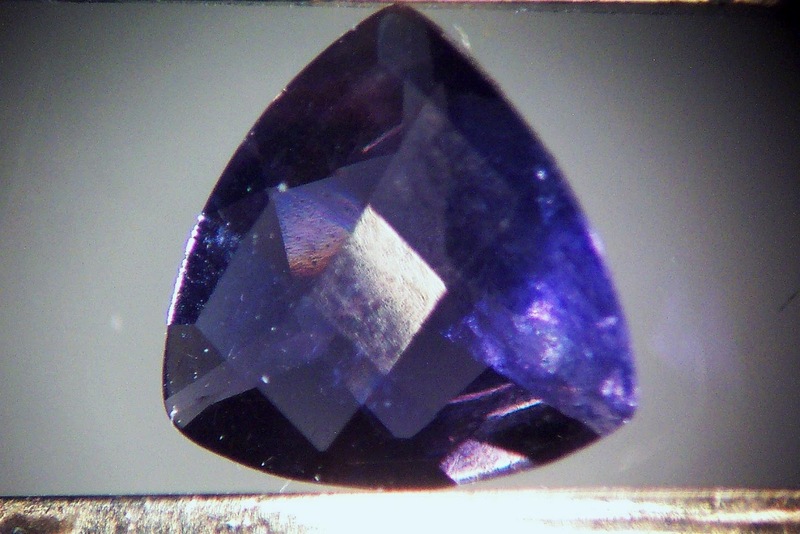 Iolite sells for only about $15 to $150 per carat, but if marketed like Tanzanite was marketed, one could increase the value of this (and other deposits in this region) to the most valuable mineral deposits on earth! But to develop this will take a lot of money and support. stones at Grizzly Creek, Wyoming. So what did I get for finding two of the largest colored gemstone deposits on earth? Well, like the song goes, the director got the mine and I got the shaft. But am I bitter? Yes! Largest iolite in world at 24,150 carats from Grizzly Creek, Wyoming. Much larger stones were left in outcrop.